This article covers the basics of multithreading in Python programming language. Just like multiprocessing, multithreading is a way of achieving multitasking. 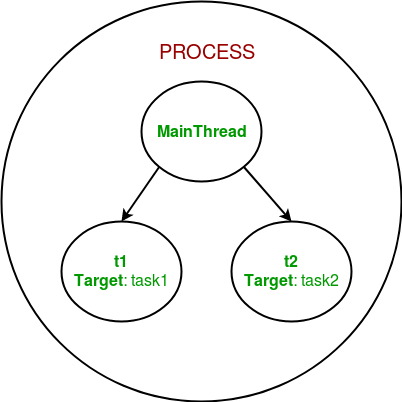 In multithreading, the concept of threads is used. Let us first understand the concept of thread in computer architecture. A thread is an entity within a process that can be scheduled for execution. Also, it is the smallest unit of processing that can be performed in an OS (Operating System). 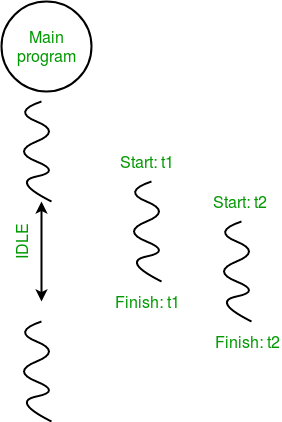 In simple words, a thread is a sequence of such instructions within a program that can be executed independently of other code. For simplicity, you can assume that a thread is simply a subset of a process! Stack pointer: Points to thread’s stack in the process. 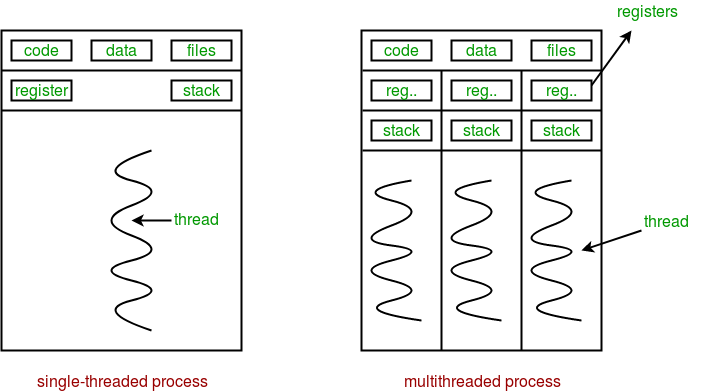 Stack contains the local variables under thread’s scope. Program counter: a register which stores the address of the instruction currently being executed by thread. Thread state: can be running, ready, waiting, start or done. Thread’s register set: registers assigned to thread for computations. 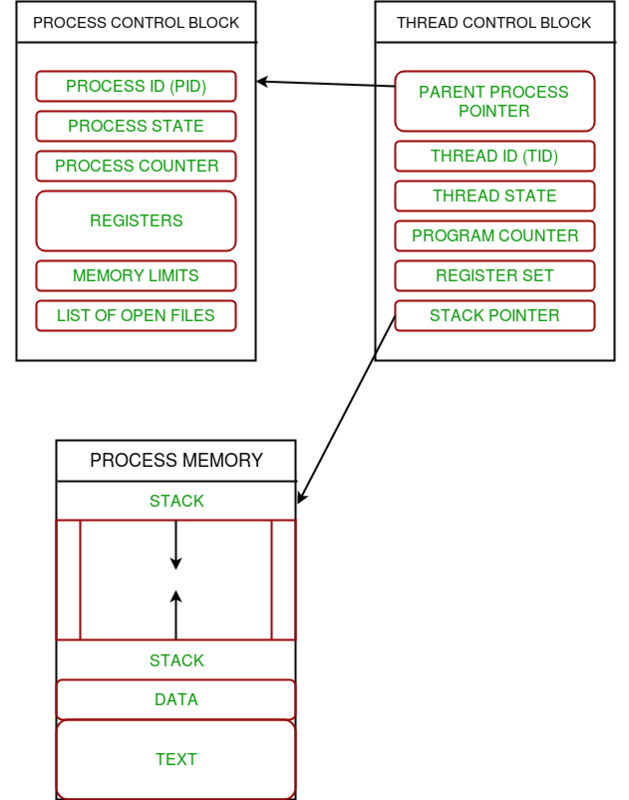 Parent process Pointer: A pointer to the Process control block (PCB) of the process that the thread lives on. Each thread contains its own register set and local variables (stored in stack). All thread of a process share global variables (stored in heap) and the program code. Multithreading is defined as the ability of a processor to execute multiple threads concurrently. In a simple, single-core CPU, it is achieved using frequent switching between threads. This is termed as context switching. In context switching, the state of a thread is saved and state of another thread is loaded whenever any interrupt (due to I/O or manually set) takes place. Context switching takes place so frequently that all the threads appear to be running parallely (this is termed as multitasking). In Python, the threading module provides a very simple and intuitive API for spawning multiple threads in a program. To start a thread, we use start method of Thread class. Once the threads start, the current program (you can think of it like a main thread) also keeps on executing. In order to stop execution of current program until a thread is complete, we use join method. As a result, the current program will first wait for the completion of t1 and then t2. Once, they are finished, the remaining statements of current program are executed. We use os.getpid() function to get ID of current process. As it is clear from the output, the process ID remains same for all threads. 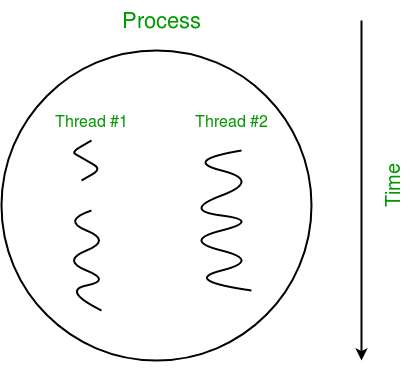 We use threading.main_thread() function to get the main thread object. In normal conditions, the main thread is the thread from which the Python interpreter was started. name attribute of thread object is used to get the name of thread. We use the threading.current_thread() function to get the current thread object. So, this was a brief introduction to multithreading in Python. The next article in this series covers synchronization between multiple threads. This article is contributed by Nikhil Kumar. If you like GeeksforGeeks and would like to contribute, you can also write an article using contribute.geeksforgeeks.org or mail your article to contribute@geeksforgeeks.org. See your article appearing on the GeeksforGeeks main page and help other Geeks.